Young Fawn, Photo by D.Mason, May 2013. 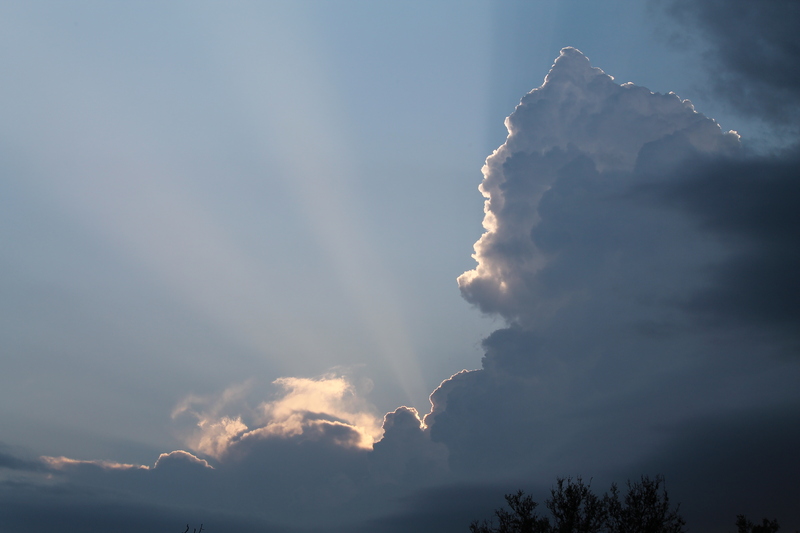 Well, here we are in April already – cool mornings, warm afternoons with plenty of sunshine and an adequate amount of rain. The grass is growing and the birds are nesting. Therefore, I would like to take this opportunity to remind everyone of a couple of things regarding our whitetail herd and turkey flock. The early breeding does will begin fawning soon. Please be careful when you are mowing your tall grass. The does hide their newborns in it and the fawns are instinctively not going to move when danger approaches. This brings me to the next reminder. If you find a fawn and you do not see the doe around, don’t worry. Mom knows where she left her baby. 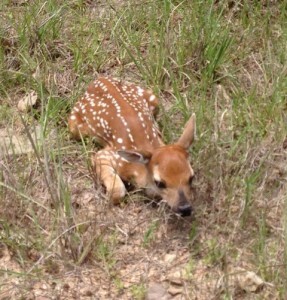 Take a moment to admire nature’s creation then leave the fawn(s) undisturbed. Mom will take care of the rest. Many of you have had the opportunity to observe the turkeys courting this spring. Our local flock has really grown over the years. They will be nesting soon in nests made on the ground, hiding their nests in tall grasses and scrub thickets. That’s something else to watch for. My last comment would be for those who feed supplemental protein. You might consider continuing feeding for another couple of months. 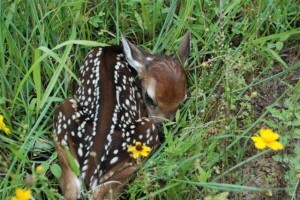 Right now, there is plenty of natural forage available for the deer but demands are high for a lactating doe. A doe will pass on any protein she takes in to her fawn(s). A little boost now could help them get thru the dry time of summer. 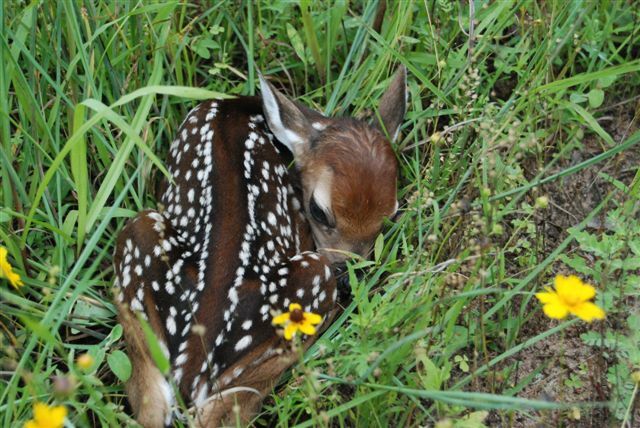 Whitetail Fawn still wet from birth; Photo by B.LaVergne, Spring 2007. 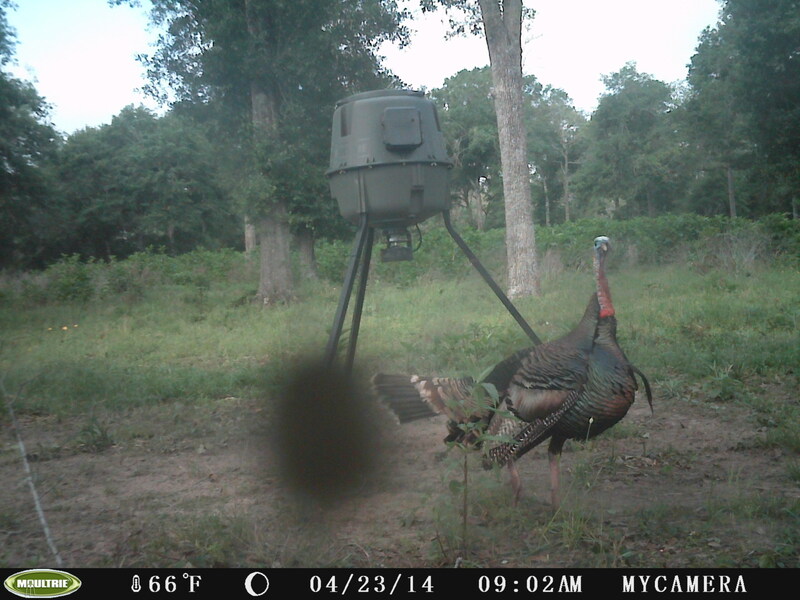 Bag limit: 1 (gobblers only). This beautiful bird posed for a photo while visiting my south feeder. 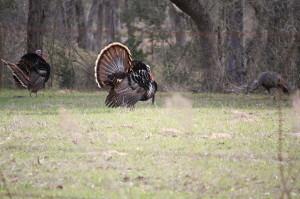 The Oakridge Ranch habitat is very supportive of Rio Grand turkeys and we’ve had numerous sightings this year. 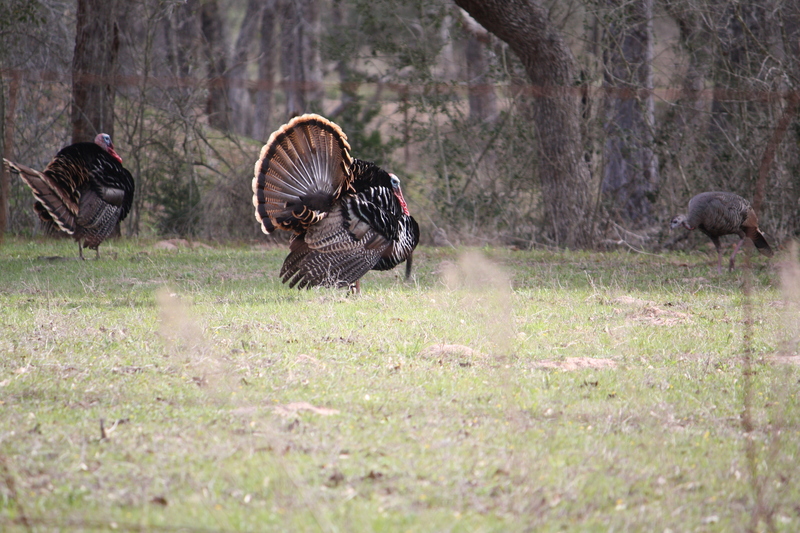 Please share your recent photos of turkey or quail that you have seen within the ranch. “Bobwhite!” The peaceful call of the Northern Bobwhite, commonly referred to as Bobwhite Quail, is a peaceful sound that echoes through the woods where these moderately-sized birds live. The bobwhite is a ground dwelling bird with adults standing six to seven inches in height and weigh about six to seven ounces. The male’s upper parts are reddish-brown, while the belly is pale and streaked. There is a white stripe above the eye and a white patch framed in black on the throat. The female looks like the male with the exception of the white patch on the throat being caramel-colored instead. They travel in coveys of two or more families and once they pair with a mate, they stay with that mate until death. Both parents will incubate a brood for about 24 days with the young leaving the nest shortly after hatching. Both parents then lead the young birds to feed and care for them for about two weeks until their first flight. They raise 1 to 2 broods of 12 to 16 eggs per year. The bobwhite is a non-migratory, year-round resident found mostly in the eastern and mid-western United States from southern Ontario and Maine, west to southern Minnesota, South Dakota, and southeastern Wyoming, and south to the Gulf coast and eastern Mexico. Their habitat includes active and fallow crop fields, pastures, grasslands, woodlands, and brushy areas. The bobwhite’s diet consists of grass seeds such as ragweed, panic grass, Johnson grass, spurges, crotons, chittamwood, dayflowers, black locust, sweetgum, sunflowers, crabgrass, foxtail, bull grasses, beggar’s-tick, smartweed, oaks, pines, and ash. In addition to grass seed, they consume legumes such as partridge pea and mild pea. The bobwhite also enjoy eating cultivated grains such as soybeans, wheat, millet, corn, tick trefoil, grain sorghum, buckwheat, rye, cowpeas, prairie clovers, and peanuts. Added to their diet is wild fruits such as mulberries, blackberries, bayberries, Muscadine, hackberry, plums, pokeberries, raspberries, strawberries, huckleberries, wax myrtle, grapes, rose hips, persimmons as well as berries of dogwood, sumac, poison ivy, and greenbrier. Finally the bobwhite eat insects and arthropods such as grasshoppers, flies, aphids, spiders, ants, leafhoppers, mosquitoes, potato beetles, snails, and others. They require daily easy access to water as well. Since the bobwhite are ground dwelling birds, their nesting cover is normally native grasses or dense vegetation communities with open passable alleyways on or near the ground. They avoid areas that encourage rodent populations, fire ants, and snakes as these are major predators of bobwhite nests. The nest is a shallow depression lined with dry grasses located in grass clumps that range from 6 to 18 inches in height. 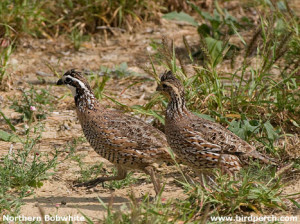 Once hatched, the brood-rearing cover differs from the nesting cover to enable movement of quail chicks. As much as 70 percent of this area can be open with overhead concealment and a diversity of low-growing green foliage and abundant insects. During the winter months, a woody cover where snow is abundant is preferred by the bobwhite. Tangled thickets, dense grasses, shrubs, and other vegetation that conceal quail from predators are used as escape cover when located close to travel lanes, nesting, brood-rearing and loafing areas. The bobwhite, once very popular and numerous, initially provided a subsistence food for settlers. During the early 1900’s however, hunting and trapping of quail became popular as markets developed to sell them. This practice, along with the reduction of food sources, nesting and protective covering has reduced the quail population by as much as 70 to 90 percent. Although these birds are not typical backyard birds, in the appropriate habitat they will visit ground feeders for seeds or cracked corn as well as ground-level bird baths. To encourage bobwhites to visit your area, one should avoid insecticide sprays and choose low shrubs for landscaping to make them feel secure. For more information, visit the internet and search either Northern Bobwhite or Bobwhite Quail.